Vegan Rose Mango Lassi Popsicles (V+GF): These flavorful, easy & delicious popsicles made using mango pulp, coconut, and a few ingredients. 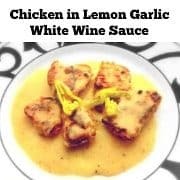 Stays in the freezer for a week or two. Summer is in full swing and we had a very hot weekend but thanks to these Vegan Rose Mango Lassi Popsicles that we were able to maintain our sanity 😉 . For the past few days, it goes in the upper 90’s and the weekend become especially hot, so we are definitely looking at a lot of indoor time and activities. And the extremely sunny weekends either means lots of tv time (which we are not much keen on) or the best thing is to call friends over and enjoy the day. That’s exactly what we did this Sunday and made tons of these popsicles to share. 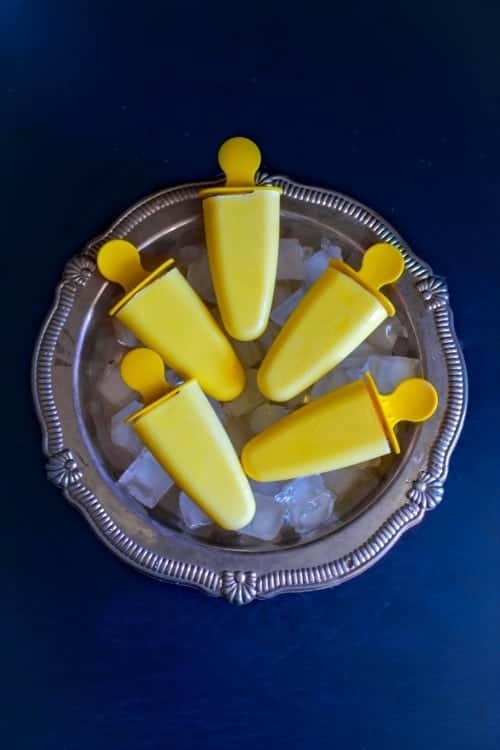 Now, Mango Lassi is all of our favorite summer drink and these popsicles were the next best thing that you can make using the lassi!! And to take things a notch higher, we are adding Nielson Massey rose-water to even further highlight the flavors. 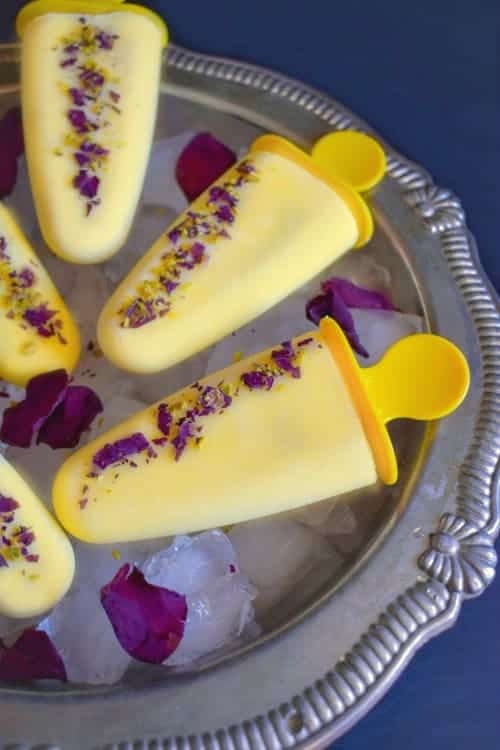 So, no matter how hot it is outside, you don’t have to sweat a ton to make these delicious Vegan Rose Mango Lassi Popsicles as the recipe comes together in 3-4 minutes. The only thing you’ve to decide is what to do for the next 2hours that it takes to freeze them. Or unless you’re going to check on them again and again which might just increase the freeze time further. Here’s the picture of how the popsicles actually look once they are finally frozen and been un-molded. The trick to un-molding them without any trouble is to take a large bowl full of warm water and dip the frozen ice-cream molds in it for 3-4 seconds. Then gently take out the molds, twist the cap and little and pull out the ice-creams ever so gently. They come out really easily without breaking any part of the ice-cream. 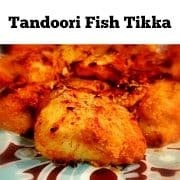 (do give it a try next time you need to unmold one or when you try this recipe). 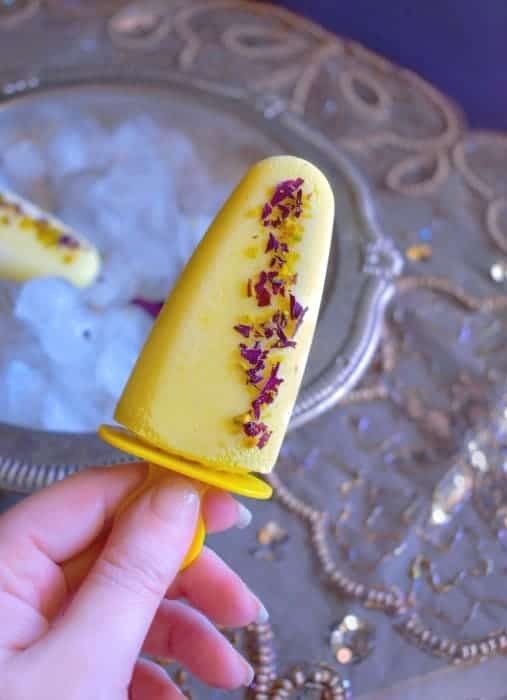 Once these Vegan Rose Mango Lassi Popsicles were out, I simply sprinkled some chopped dry rose-petals and pistachio over it. Press it gently into the popsicles and then serve immediately – and that’s it, this is exactly how easy it is to make these fragrant and flavorful pops. The only problem I have with them is trying to stop at after eating just one. Apart from this friend’s whom we met in the afternoon, I’m also meeting my girlfriends at my other friend’s house to watch the new season of ‘Game of Thrones’ ;). 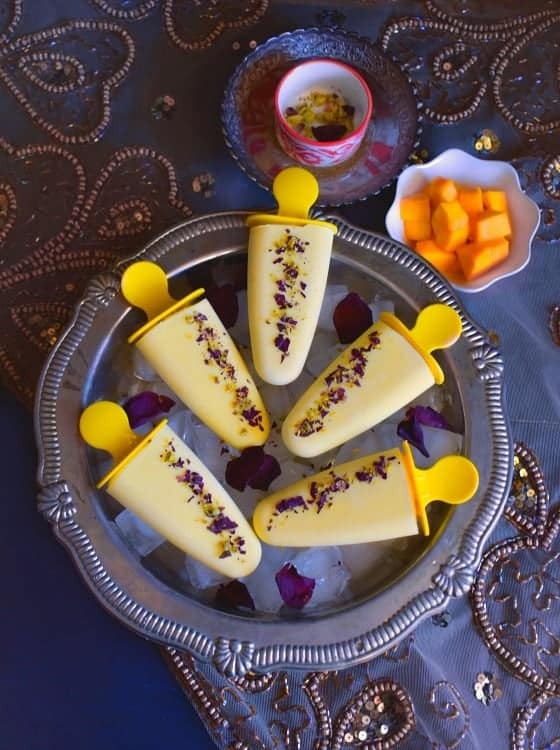 So go ahead and beat the heat in total deliciousness and fun way by making these Best Ever Vegan Rose Mango Lassi Popsicles and sharing with your loved ones. Vegan Rose Mango Lassi Popsicles (V+GF): These flavorful, easy & delicious popsicles made using mango pulp, coconut and few ingredients. In a blender, add mango, yogurt, milk, rose water, cardamom and blend till smooth. Pour the lassi in ice-cream molds, filling to the top. Place ice-cream stick or cover and place in freezer for 2hours or till popsicles are completely frozen. Once frozen, remove from fridge and immediately place the molds in warm water bowl (2-3 seconds). Remove the molds from the bowl and lightly open the cover and pull the popsicles out. (This method will gently remove the ice-cream). Sprinkle the crushed rose petals + chopped pistachio on each popsicle and press it gently for it to stick to the bars. It takes 4 minutes to make the rose-mango lassi and about 2-3 hours to freeze them. 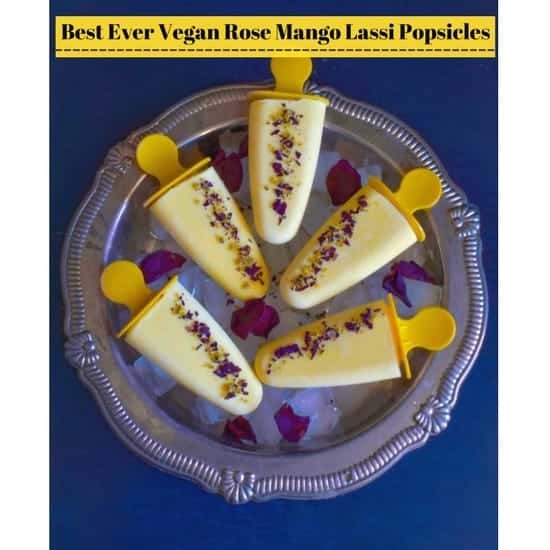 15 Replies to "Vegan Rose Mango Lassi Popsicles (V+GF)"
Molly, these are so beautiful!! 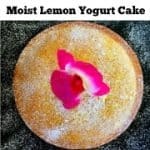 What a delicious summer treat! 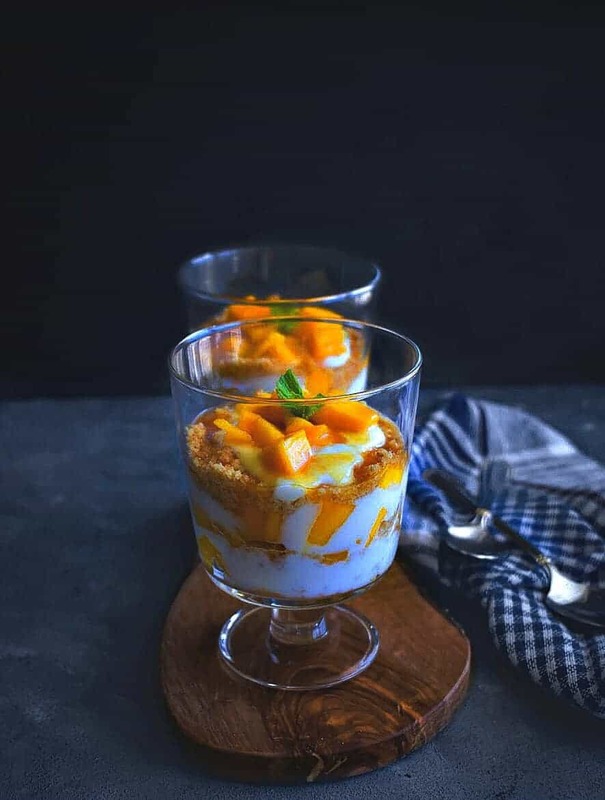 I Love the combination of Mango and Coconut. 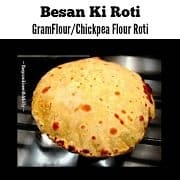 Last week I used the combination for another dessert and the kids loved it. These look so refreshing.. YUM! We love Mango Lassi Popsicles. Perfect treat for the summer. Last year my son was hooked onto similar popsicles. I can so imagine, these are totally addicting!! We sure are needing those popsicles this week. The heat index is supposed to get in the triple digits! The great part about your popsicles is that the ingredients are good for you too. My grandsons would love them. triple digit would be super hot and I feel you’ll be trying them soon 😉 Thanks for visiting. 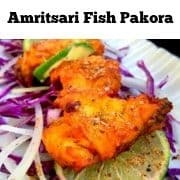 you always have the most beautiful food ideas this ice pops look so good and mango I love that fruit mango lassi is one of my Indian cuisine must haves bravo! Wow, these Popsicles are beautiful. I bet they taste just as good as they look, too. Perfect for a hot summers day. These are just so beautiful! I bet they taste as yummy as they look! Another use for my Rose water now! I can’t wait to try , I’ve got my hands on some incredible mangoes this weekend!